Smart Hydro from iHouse | OhGizmo! I’ll just look the other way and prentend I didn’t notice the cheap abuse of the “iSomething”. 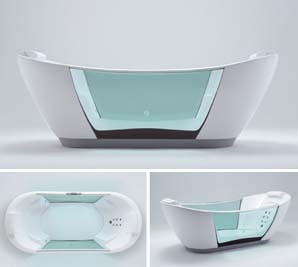 The Smart Hydro, from company iHouse is an intelligent bath. You can communicate with it in a number of ways: through your cellphone, PDA, or even across the internet. This way, you can tell it when to prepare your bath for you, what temperature to make it and such. You can even “watch the progress over the internet”. Don’t exactly know why I’d want to watch my bathtub filling up on the internet, but well, there you have it. There’s a ton more details inside. • Selection of water level, temperature, amount of bath essence and light intensity. • Memory with storage for personalized settings. • Voice system to inform users when the bath is ready. • Self cleaning: With a simple command from the instrument panel, this function initiates the circulation of water plus detergent through all the Smart Hydro’s internal water-bearing systems and in the interior of the bathtub. When the operation is over, Smart Hydro automatically empties. • Design: A harmonious combination of technology, sophistication and the finest materials. The acrylic body maintains its shine much longer. Side windows allow you to see the interior. The exterior is lined with either acrylic or wood. The LED- based internal illumination system provides more beauty and efficiency for much longer than conventional illumination systems. • Hydromassage Function: The user’s lower back is massaged by 7 strategically located jets with completely customizable pressure. • Smart Tech Support: Whenever it’s turned on, the Smart Hydro monitors its vital systems and, if it identifies a potential problem, it immediately informs tech support. In this way, problems can be solved before the owner ever notices them. No price to be seen anywhere, but I guess it’s one of those things that, if you have to ask, you probably can’t afford it. The website is here. Story VIA The Cool Hunter. crazy style, but very interesting!